I came across this 45 in a pile of records that had already been pillaged by a few serious local collectors and record dealers. Don't know why the hunters passed it up, but I'm glad. Perhaps it's really only a 25 cent 45. My interests in somewhat 'obtuse' sounding stuff and indie soul has for me, paid off yet again. Just goes to show there are still treasures even in the most covered territories. You just have to be willing to hear something dope and new in something that's far from the norm. For me, that's always been an area that has been my strong point. Often you may have to face a little ridicule, but I've learned over the years that same ridicule is a sign of progress and genuinely shows you're headed in the right direction. Anyways, I was late in the morning to this spot and even though it had been well scoured, I still found a few treats. In fact, I think this is the same spot I picked up the 'Blue-eyed' soul record by the group Stratus. Not the one from Denver. The Stratus record had the notorious orange spray paint from Rasputin's, so I suppose it had been quadruple overlooked. Anyways, back to Kieth And Darrell. These guys were in fact nephews of Smokey Robinson. They had somewhere around three or four releases including an attempt at boogie disco in 1983 with a tune called 'Work That Body' on a Motown twelve inch. Another 45 with the peculiar title of 'You're My Gardener' saw a similar release on a promo only 45. I wonder what that one sounds like. This tune for me fits best in a 'free soul' genre as it's kinda lazy, kinda cool, and a little bit hippie. It has that kinda yacht rock sunshine soul feel I'm always looking for. It's easy to see why this flew under the radar, and one could suspect that Keith And Darrell were trying to gently elbow their way into the recording biz considering their bloodline. 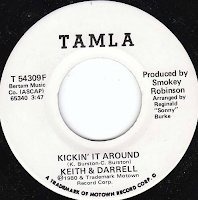 The fate of Keith Larnell Burston and Darrell Littlejohn was of limited push and belief in them by the record label and as a result they never fully broke out. As far as I was concerned, from a digging perspective, this had ALL the right elements...produced by Smokey Robinson, from 1980, and was a promo only. It could be that this record never saw a full release and only came out as a promo. Some nice harmonies, an affectionate little premise, and some light and snappy drums. I was glad to pick it up, hope you enjoy it too. I remember when this song was performed around 79 or 80 on a Smokey Robinson special on cable. I was hoping to hear more from this group but I never did. Then in 95, I hear this album by D'angelo entitled "Brown Sugar." 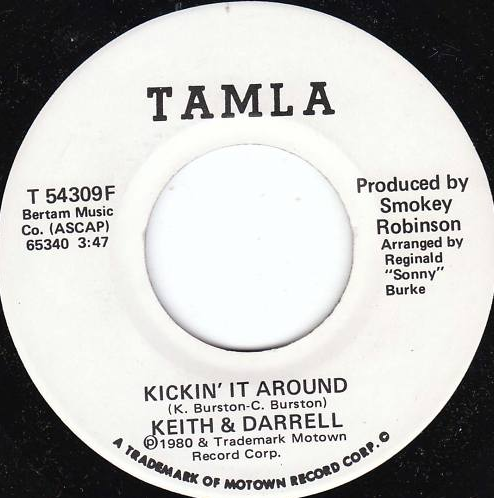 The style all through out the album reminded me of "Kickin' Around." It's also ironic that on this same album is a remake of Smokey's "Crusin." I wonder if there is a connection indeed. Nevertheless, glad to be able to hear this song again after all these years.